When Raif Sevrance and his brother return home to their clan as the only survivors of a vicious attack in which both the their father and clan chief were killed, it is not only grief that clouds Raif's thoughts. The new chiief's reign is a brutal one, made worse by his brother's acceptance of it. When his uncle, Angus Lok, invites Raif to accompany him to Spire Vanis, it seems that he has no choice but to leave his home.. It is the start of a journey that will change his life - and the world he inhabits. 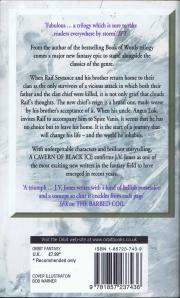 With unforgettable characters and brilliant storytelling A CAVERN OF BLACK ICE confirms J.V. 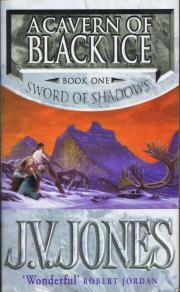 Jones as one of the most exciting new writers in the fantasy field to have emerged in recent years.